US 1918 Trench Brass Knuckle Folding Knife | BUDK.com - Knives & Swords At The Lowest Prices! This knife is a historically accurate replica of the US 1918 trench knife. The blade is constructed of 1045 surgical steel and the knife features a steel frame and a liner-lock mechanism. The handle offers a knuckle guard, typical of the trench knife. At first I wasn't sure how practical a trench knife was as a pocket knife, but now that I've had it for a few days, I'm really enjoying it. The only thing that would've made it better was if the knife was all metal so it could be used as brass knuckles. I have a reproduction 1918 Trench Knife with a Doughboy helmet mounted on it. Looks pretty cool in my War Room. When I saw this modern folder version, I had to have it for my collection. Happy I did, it's a nice addition and fun to show friends. For the price, you can't beat it! Highly recommend it! Bought this for self defense, easy to conceal, knife opens well after a few tries to loosen it up a bit. Came out of the box sharp, and fits my hand pretty good. 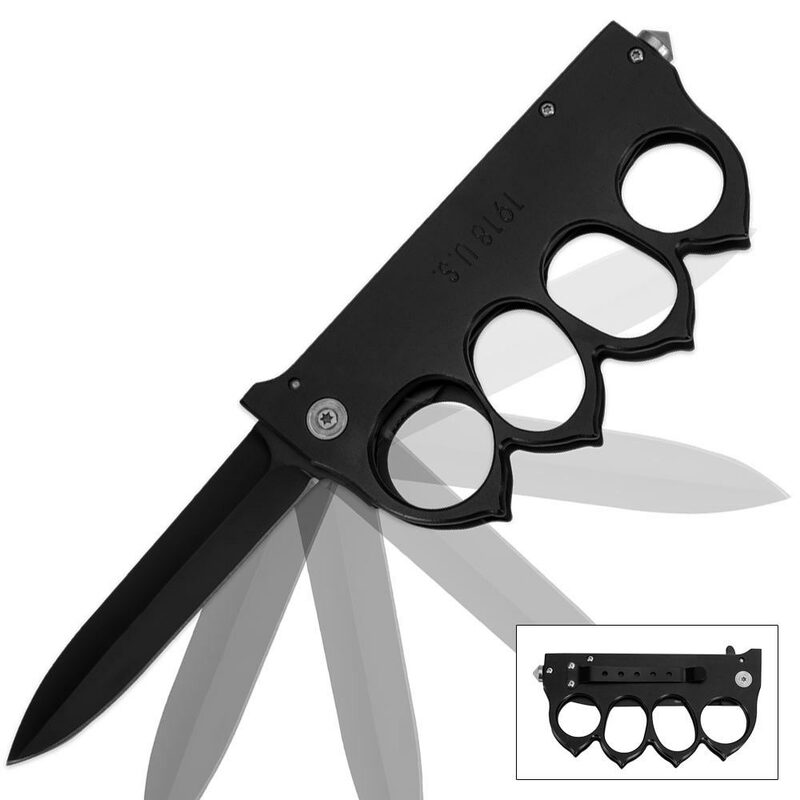 Imagine getting into a scuff and then knock some body down with the knuckles....and the Xtra security of a knife...easily a winner in my book. It's worth buying! This is going to be my pocketknife that I'm going to be carrying everyday. It came sharp out of the box. Being a brass nickel folding knife it still fits inside my pocket. I bought this knife because it had a good reviews and the reviews are right about this knight. It was a little stiff coming out of the package, but a few test runs and it's now very smooth. Great knife. Great for a display piece as well. Better than I expected. Assisted opening works well. Looks good, feels good. Recommended! this is not a paper weight or a toy, the blade comes out fast and locks up tight. Blade is sharp, sharp enough to cut yourself, as I did by mistake so be careful. Functions as brass knuckle with blade folded, glass breaker on the end, and a bladed melee weapon/ utility knife when deployed, A great survival option for 10 bucks, aluminum chassis keeps it light and portable. I keep it in the my console in case I'm involved in an accident and can't exit my vehicle. The blade would certainly cut through a seat belt and I'm sure that the stud would allow me to break through my driver's side window or sunroof. Wish the blade was an OTF type though.